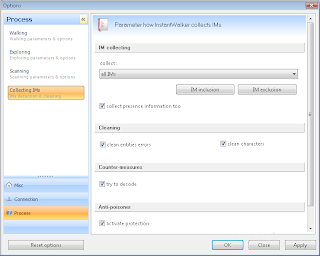 InstantWalker is an instant messaging addresses collector, which runs on Windows 2000, Windows XP and Windows Vista. You indicate which sites you want to start this collect with (for eg. a Google search result, competitors sites, web directories, forums,...) then you start the exploration and you just have to look at the user names filling the results list. You can use InstantWalker to improve the performances of your promotional campaigns by sending mass IMs. InstantWalker can collect AOL Instant Messenger, Gajim, Gadu-Gadu, gTalk, ICQ, jabber, Psi, Skype, XMPP, Yahoo! Messenger, iChat, Windows Live Messenger addresses.